Slated to appear on the Fox TV series “American Idol” in the spring, 2016 Tri-Village graduate Knox Morris will be heading to Nashville soon to pursue his musical career. NEW MADISON — Slated to appear on the Fox TV series “American Idol” in the spring, 2016 Tri-Village graduate Knox Morris will head to Nashville, Tennessee soon to pursue his musical career. Morris, 21, originally hails from Springfield but moved to New Madison when he was 15. As a result, Morris said, he wound up picking up an acoustic guitar he hadn’t touched since he was 10 years old and starting to teach himself how to play. Morris got his feet wet performing for an audience by playing the first dance song at his cousin’s wedding. 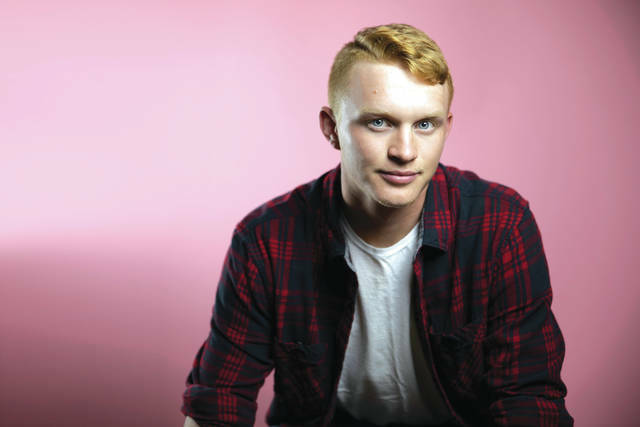 During his first semester at Ohio University, Morris started playing at open mic nights in Athens then stepped things up a notch after returning to Darke County for the holidays. Morris auditioned for “America’s Got Talent” shortly thereafter. “I was just getting started, so they shooed me away pretty quick,” Morris said. In September Morris attended auditions for “American Idol” in Columbus, Atlanta and Louisville, Kentucky where he filmed in front of hosts Katy Perry, Lionel Richie and Luke Bryan. The season in which Morris is expected to appear will begin airing in March of this year. Morris said his favorite part of the auditioning process was getting to interact with fellow artists and musicians from all over the country. After the “American Idol” auditions, a friend and fellow local musician, Tommy Renfro, sent some videos of Morris performing to recruiters at Zodlounge, a music production company in Nashville. “And they said, ‘Can you get him here next week?’” Morris said. Morris will play a show this Friday at Donkey Coffee and Espresso in Athens; he’ll appear at Carmie’s BBQ and Grill in Tiffin on Jan. 26. He also has an EP consisting of three or four songs set to be released by the end of 2019 and hopes to move to Nashville sometime in the next month to continue pursuing his music. He credits Brett Vargason, Tom Michael, and Aaron Moses — the producers he’s been working with at Zodlounge — with helping bring about these exciting new developments in his life. This entry was tagged America’s Got Talent, American Idol, Atlanta, Columbus, guitar, Katy Perry, Kentucky, Knox Morris, Lionel Richie, Louisville, Luke Bryan, music, musician, Nashville, New Madison, television, Tennessee, Tommy Renfro, Tri-Village, Zodlounge. Bookmark the permalink.